Home Alien Life The WOW signal rediscovered! Late one night in the summer of 1977, a large radio telescope outside Delaware, Ohio intercepted a radio signal that seemed for a brief time like it might change the course of human history. The telescope was searching the sky on behalf of SETI, the Search for Extraterrestrial Intelligence, and the signal, though it lasted only seventy-two seconds, fit the profile of a message beamed from another world. Despite its potential import, several days went by before Jerry Ehman, a project scientist for SETI, noticed the data. He was flipping through the computer printouts generated by the telescope when he noticed a string of letters within a long sequence of low numbers—ones, twos, threes and fours. The low numbers represent background noise, the low hum of an ordinary signal. As the telescope swept across the sky, it momentarily landed on something quite extraordinary, causing the signal to surge and the computer to shift from numbers to letters and then keep climbing all the way up to “U,” which represented a signal thirty times higher than the background noise level. 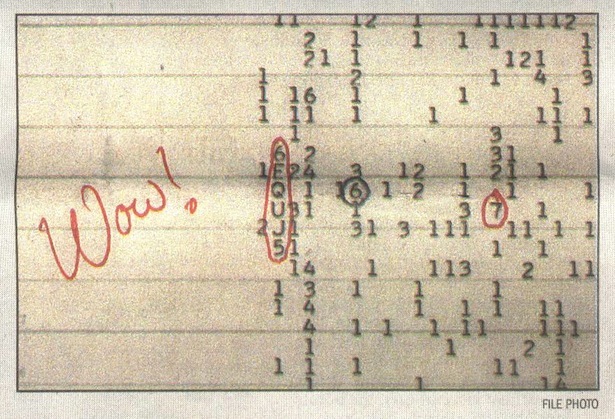 Seeing the consecutive letters, the mark of something strange or even alien, Ehman circled them in red ink and wrote “Wow!” thus christening the most famous and tantalizing signal of SETI’s short history: The “Wow!” signal. Despite several decades of searching, by amateur and professional astronomers alike, the “Wow!” signal has never again been found. In his new book, The Elusive Wow, amateur astronomer Robert Gray tells the story of the “Wow!” signal, and of astronomy’s quest to solve the puzzle of its origin. It’s a story he is well-positioned to tell. That’s because Gray has been the “Wow!” signal’s most devoted seeker and chronicler, having traveled to the very ends of the earth in search of it. Gray has even co-authored several scientific articles about the “Wow!” signal, including a paper detailing his use of the Very Large Array Radio Observatory in New Mexico to search for it. I spoke with Gray about the “Wow!” signal, radio telescopes, and the economics of prospective extraterrestrial civilizations. From a technical standpoint, what makes the “Wow!” signal so extraordinary? Gray: The main thing is the profile of the signal, the way it rises and falls over about seventy-two seconds. When we point these big dish antennas up at the sky, and a radio source moves across them, they have a special signature, a kind of fingerprint. That fingerprint results from the “loudness” of the radio source slowly increasing, getting to a peak as the dish points straight at it, and then slowly decreasing as the object moves across the dish and past its beam of observation. In the case of the “Wow!” signal, the signal followed that curve perfectly. It looked exactly like a radio signal in the sky would look, and it’s pretty unlikely that anything else—like an airplane or satellite or what have you—would leave a special signature like that. Also there’s not much doubt that the “Wow!” signal was a radio signal, rather than something from a natural source like a quasar. That’s because Ohio State was using a receiver with fifty channels, which is sort of like having fifty AM radios, each tuned to adjacent stations. With the “Wow!” there wasn’t any noise on any of the channels except for one, and that’s just not the way natural radio sources work. Natural radio sources diffuse static across all frequencies, rather than hitting at a single frequency. So it’s pretty clear that this was a radio signal and not a quasar or pulsar or some other natural radio source, of which there are millions. It was very narrow band, very concentrated, exactly like a radio station, or a broadcast, from another world would look. The “Wow!” signal turned up very close to the frequency at which hydrogen glows. Why is that significant?